Laser Rick is the name of our new laser cutter. 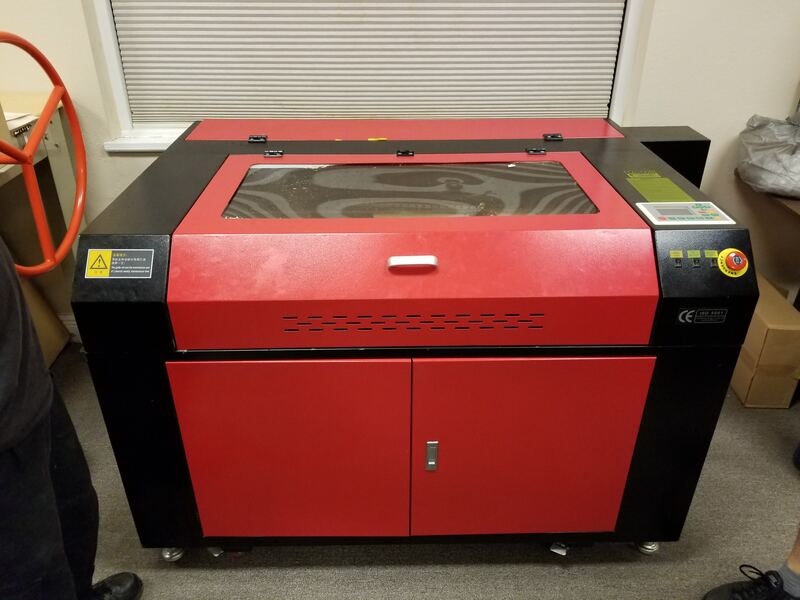 700x500 mm, 27.6“x19.7”, 100 Watt, CO2, water cooled, serious hobby laser engraver. After replacing fuse and fuse holder with 3D printed version at the the main power input it is working again. Main power switch no longer presses the switch inside when rotated. Small pieces of acrylic shoved into switch and zip tied to keep main power switch pressed. Operate the power on/off now with the big red emergency cut off button/switch. Still setting up and creating final version of step by step instructions. Still needs duct work ran correctly in the ceiling. THIS TABLE NEEDS TO BE UPDATED FOR THE NEW LASER. THIS IS CURRENTLY FOR THE OLD 40 WATT LASER. MARK UPDATED NUMBERS WITH MM/S AND % SIGN.